Front-time Reworkings #2. Still from video. 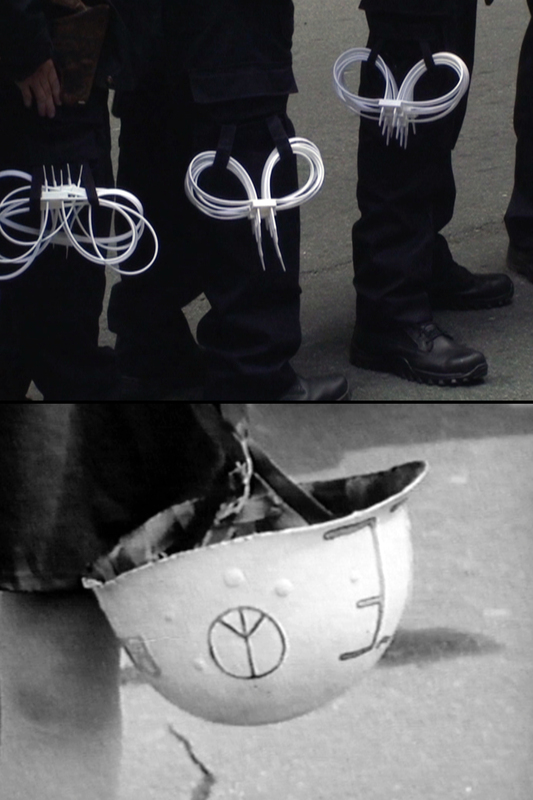 Archival material from the documentary ‘Revolution Now’ (by Öyvind Fahlström for SVT), 1968. Photo: Peter Davis, Staffan Lamm. 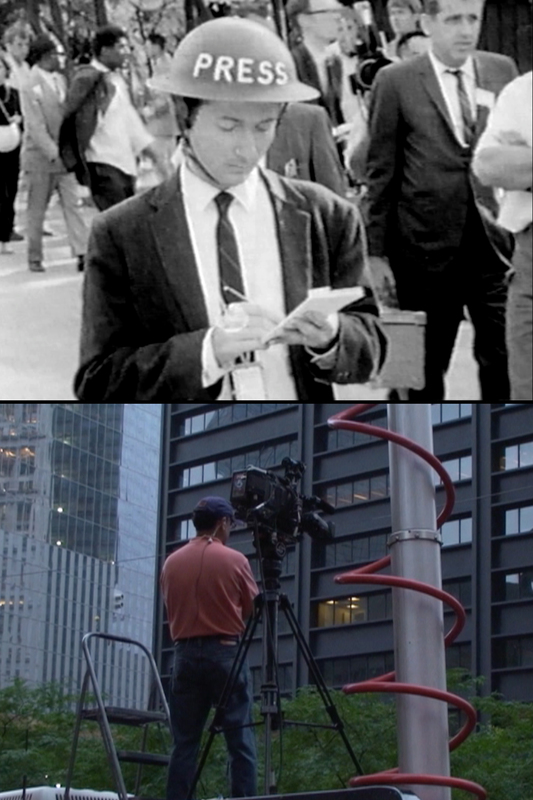 The contemporary footage was filmed in New York, 2011-2012. Photo: Anna Lundh. Places: Washington Square Park, Zuccotti Park, Gramercy Park, Foley Square, Times Square, Grand Central Station, Central Park, Cooper Square, Wall Street (New York City), Fort Hamilton (Brooklyn), Grant Park (Chicago). In the 1960s and 1970s, Swedish artists Öyvind Fahlström and Barbro Östlihn lived and worked in New York, on 128 Front Street in the Lower Manhattan. The series Front-time Reworkings looks at their artistic work methods (and records of such methods), and “reworks” certain aspects of these, from a future perspective. Öyvind Fahlström was an avid observer of the world and city around him, and – more in the role of journalist than artist – he reported home to Sweden about what was happening in the USA in articles, radio segments and a couple of documentaries for Swedish television. 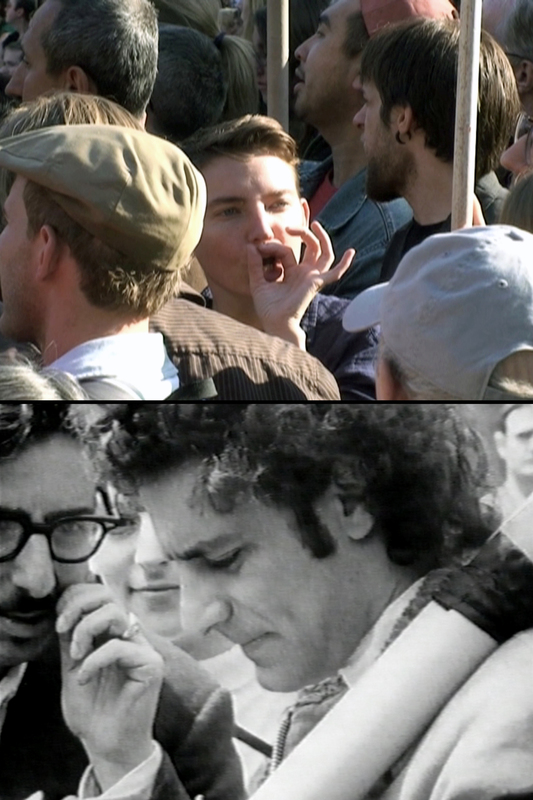 One is ‘Revolution Now’, made in 1968, about oppositional groups and their protests (such as the ‘Yippie’ movement) in New York and Chicago. 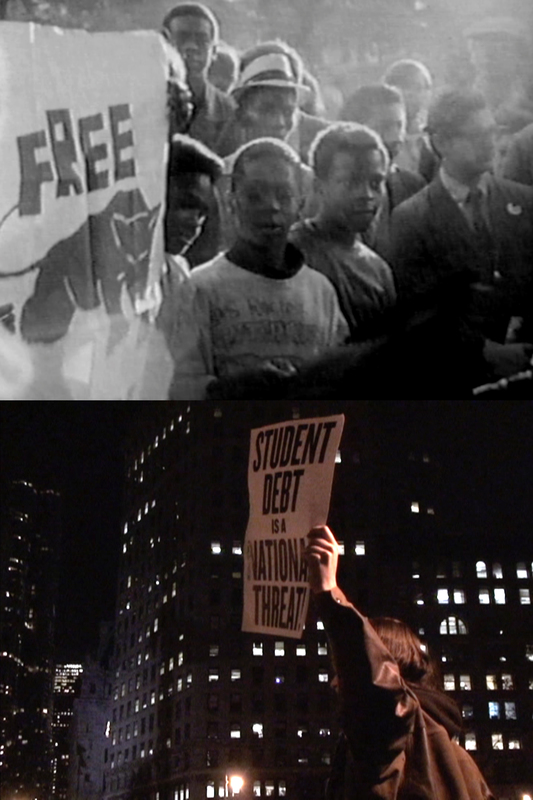 Between 2011 – 2012 I documented the ‘Occupy Wall St’ movement in New York; protests, marches, assemblys. 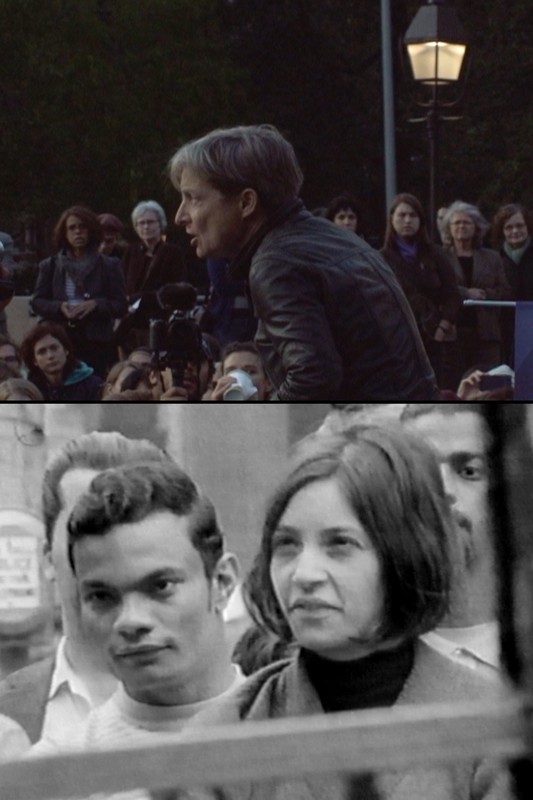 By cutting out fragments from Fahlström’s television documentary ‘Revolution Now’, and reediting them in dialogue with my own footage (as well as vice versa), these two moments in time can cross contaminate each other. 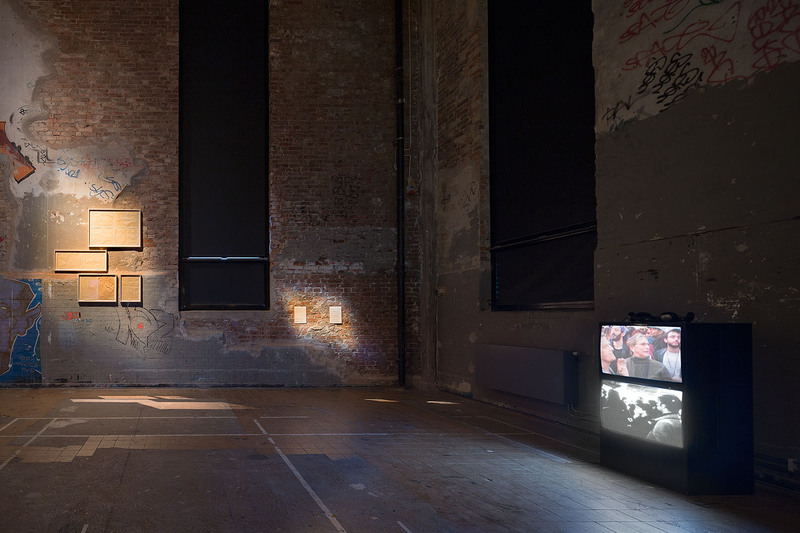 An early version was exhibited at ‘Matter Out of Place’ at The Kitchen, New York in June 2012. The final version was produced for ‘The Moderna Exhibition 2014 – Society Acts‘, Moderna Museet, Malmö. 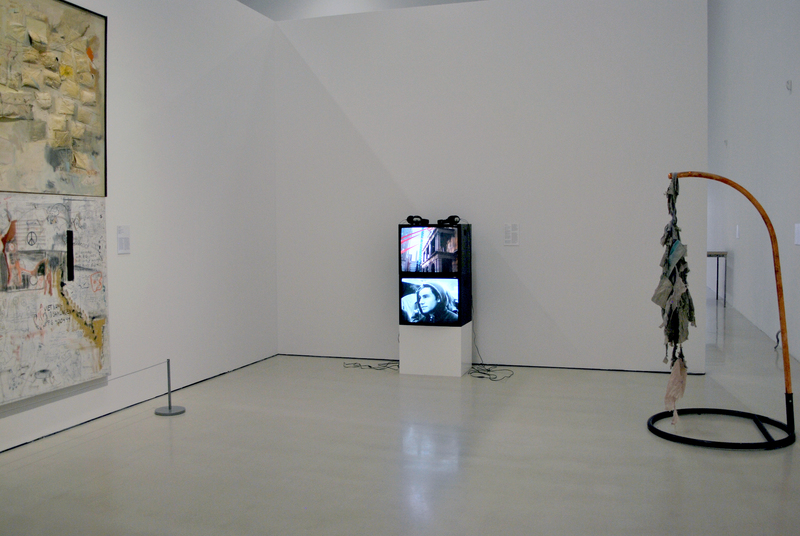 Also exhibited at GIBCA – Göteborg International Biennial for Contemporary Art, Gothenburg, 2015. The Moderna Exhibition, Moderna Museet, Malmö, 2014. A ‘reworking’ is not the same as a ‘revision’. To rework is not just looking at something again. Rework does not aim to slightly improve the original material, nor does rework have to be faithful to the original purpose [of the material]. Rework is a more intervening approach: cut out, shuffle, rearrange, play with like a puzzle, whatever you need to do to make it a useful activity in the present. A direct translation of the Swedish word for future; framtid. The time that is in front of us. (A secondary use is when referring to what happens, or happened, on Front Street, Lower Manhattan, NYC). ~ the present by pretending to be from the future. By treating and using methods and records of past artistic practices in order to challenge activities and situations of the current time. Artistic or other. ~ between countries, back and fourth. ~ in the city. Who’s streets? (our streets). A movement is only a movement if enough people are moving. How is it moving? Where is it heading?